> All Cords>Bungee Cord>Bungee Cord 1/8"
Bungee Cord 1/8" There are 41 products. 1/8" Birthday Cake shock cord is bright pink, blue, yellow, green and white. It is also known as Elastic, Stretch or Bungee Cord. Made in USA. 1/8" Gold shock cord is also known as Elastic, Stretch or Bungee Cord. Made in USA. 1/8" Silver Gray/Grey bungee cord (shock cord) is also known as elastic, stretch or bungee rope. Made in USA. 1/8" Acid Purple bungee cord is also known as shock, elastic or stretch cord or bungee rope. Made in USA. 1/8" Aloha bungee cord is pink, purple and white. It is also known as shock, elastic or stretch cord or bungee rope. Make in USA. 1/8" Turquoise shock cord is also known as Elastic, Stretch or Bungee Cord. Made in USA. 1/8" White bungee cord is also known as shock, elastic or stretch or bungee rope. Made in USA. 1/8" Desert Camo shock cord is grey, brown, black and white. It is also known as Elastic, Stretch or Bungee Cord. Make in USA. 1/8" Royal Blue shock cord is also known as Elastic, Stretch or Bungee Cord. Made in USA. 1/8" Goldenrod shock cord is also known as Elastic, Stretch or Bungee Cord. Made in USA. 1/8" Midnight Blue shock cord is also known as Elastic, Stretch or Bungee Cord. Made in USA. 1/8" Purple shock cord is also known as Elastic, Stretch or Bungee Cord. Made in USA. 1/8" Kelly Green shock cord is also known as Elastic, Stretch or Bungee Cord. Made in USA. 1/8" bungee cord Scarlet Red is also known as shock cord or bungee rope. Made in USA. 1/8" Burgundy shock cord is also known as Elastic, Stretch or Bungee Cord. Made in USA. 1/8" Colonial Blue shock cord is also known as Elastic, Stretch or Bungee Cord. Made in USA. 1/8" Navy Blue shock cord is also known as Elastic, Stretch or Bungee Cord. Made in USA. 1/8" Brown Camo shock cord is brown, tan and black. It is also known as Elastic, Stretch or Bungee Cord. Make in USA. 1/8" Napa Valley Shock Cord is acid purple, purple, olive and light pink. It is also known as Elastic, Stretch or Bungee Cord. Make in USA. 1/8" Neon Turquoise shock cord is also known as Elastic, stretch or Bungee Cord. Made in USA. 1/8" Electric Blue shock cord is also known as Elastic, Stretch or Bungee Cord. Made in USA. 1/8" Charcoal Gray/Grey shock cord is also known as Elastic, Stretch or Bungee Cord. Made in USA. 1/8" Pink Rose shock cord is also known as Elastic, Stretch or Bungee Cord. Made in USA. 1/8" Multi Camo shock cord is multiple shades of Green and Brown It is also known as Elastic, Stretch or Bungee Cord. Made in USA. 1/8" Camo shock cord is green, tan and black. It is also known as Elastic, Stretch or Bungee Cord. Make in USA. 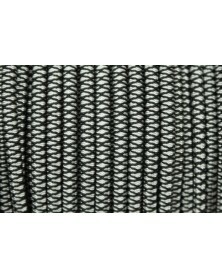 1/8" Urban Camo shock cord is White, gray and black. It is also known as Elastic, Stretch or Bungee Cord. Make in USA. 1/8" Neon Pink bungee cord with a black X pattern. It is also known as shock cord or bungee rope. Made in USA. 1/8" Country Girl Camo shock cord is pink, neon pink, purple and black, arranged in a camo pattern. It is also known as Elastic, Stretch or Bungee Cord. Make in USA. 1/8" Thin Blue Line Shock cord is Black and Blue. It is also known as Elastic, Stretch or Bungee Cord. Make in USA. 1/8" Neon Pink shock cord is also known as Elastic, Stretch or Bungee Cord. Made in USA. 1/8" Black bungee cord with Neon Pink X. It is also known as shock cord or bungee rope. Make in USA. 1/8" Diamonds Black with Silver Gray bungee cord. It is also known as shock, elastic or stretch cord or bungee rope. Made in USA. 1/8" Crimson Red shock cord is also known as Elastic, Stretch or Bungee Cord. Made in USA. 1/8" Acid Dark Brown shock cord is also known as Elastic, Stretch or Bungee Cord. Made in USA. 1/8" Neon Green shock cord is also known as Elastic, Stretch or Bungee Cord. Made in USA. 1/8" Neon Orange shock cord is also known as Elastic, Stretch or Bungee Cord. Made in USA. 1/8" Black shock cord is also known as Elastic, Stretch or Bungee Cord. Made in USA. SHOCK / BUNGEE CORD Spool Ends - 200 ft plus in assorted colors Counts as 1 item towards 50 free buckles and flat rate shipping.